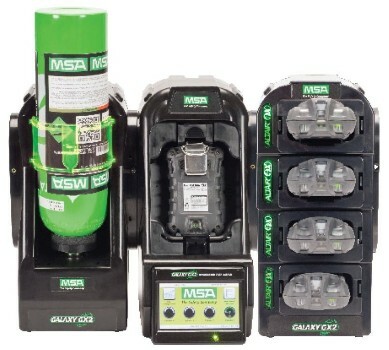 Simplicity counts with the MSA GALAXY GX2 Automated Test System for advanced safety management and effortless operation. The GALAXY GX2 Automated Test System provides simple, intelligent testing and calibration of MSA ALTAIR and ALTAIR PRO Single-Gas Detectors and ALTAIR 4X and ALTAIR 5X Multigas Detectors. Easy-to-use automated test stand offers high performance as either stand-alone unit or integrated portable detector management system, enabling total data access and control of the MSA ALTAIR family Gas Detector fleet. New MSA Link™ Pro Software for proactive safety management; gas exposure email alerts, direct data input, live filtering, test and exposure queries, collecting and printing reports. At-a-glance indicators include low calibration gas volume, expiration warnings and test stand status.